Walking through the street everyday and driving to and from work, you will have inevitably seen various street furniture. There are several types of street furniture and majority of the people today ignore it and do not even pay much attention to it. Traffic lights, benches, light posts, phone booths, billboards and other fixtures do not really offer much when it comes to design. They are considered functional and busy people just do not have the time to admire them. Not a lot of people know that street furniture and even play ground equipment can be used to improve the aesthetic value of a space. 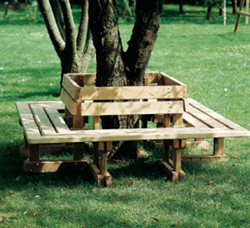 Benches which most people normally find in parks and playgrounds can also be used in your backyard. Fixtures which are usually seen in the streets and the parks can be installed in the pathways and driveways of your home. You just need to know which furniture would best suit your home and your yard. In choosing which street furniture to use, making a mistake is critical because it means money lost and money wasted. Moreover, you would also not want your yard to look like a mess. How do you make the selection process a lot easier? Make sure that the furniture is of high quality. There should be standardization marks on the body. These marks prove that the furniture has passed quality tests. Because of the fact that the furniture has to be put outdoors, you want to make sure that they will last a long time even with the constant beatings it can get from the weather and the elements. This way, you will not have to keep replacing the furniture and wasting money. There are many materials used for outdoor or street furniture and the decision regarding which material to choose should depend on the place where you live and the weather conditions. Wooden or metal furniture is great for outdoor shaded areas but they have to be treated to make them waterproof. The style and design of the furniture are also essential. You would want the pieces to fit in with the rest of the things which you have in your yard or garden. It is important to find pieces that compliment the decorations so style and design really matter. They can harmonise the entire yard. The furniture should be comfortable and useful. Regardless how nice the piece looks, if it is not comfortable, no one would like to use it. It will only be a waste of money. The furniture has to serve its intended purposes or else it will be useless. For example, the bench in your yard should give people a comfortable place to sit on. Lastly, there is the cost. Before you check pieces online or in your local furniture shops, you should consider your budget. No matter how tempting it is, you should not exceed your budget. You can still find the right furniture at affordable prices without the need to sacrifice quality. The most effective shopping method is to compare prices from various local merchants, as well as local shops. This is a must if you want the best without spending a fortune. Article by Jenny Joyce is a freelance writer who enjoys exploring children’s playgrounds, she writes about Playground Equipment. I really like this idea. I’m planning of how to start my yard work and in this article I got some ideas how to make my yard. I was stucked with many ideas of designing my yard and here also I got some good ideas. I also didn't have any idea about that street furnishers can be used to improve the aesthetic value of a space. So here I got that idea also and I thank you for sharing this article.